It was our great pleasure to finally catch this acclaimed production that's been around since it's inception in 2012 at the Harris Theater for Music and Dance. It's been touring nationally, but hasn't been seen in Chicago since 2013. The dancers are absolutely world class story tellers and a joy to see. My high school put on The Miracle Worker, and I still have vivid recollections of auditioning for the parts of both Helen and Anne. Yet many children, my own teens included, are completely unfamiliar with Helen Keller and the incredible true tale of Anne Sullivan's tenacity as her teacher. We're thrilled Chicago Children's Theatre is partnering up with Thodos Dance to bring this fabulous story to a new, younger audience. When we caught the opening performance, even the smallest kids were entranced. 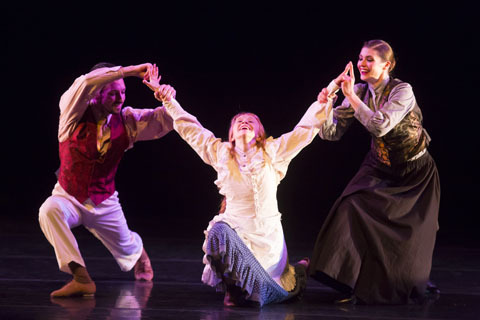 Their laughter and enjoyment at the stubborn struggles was sheer joy, and the medium of dance is so stunningly effective for this story that this piece is sure to make a lasting impression on all ages. It's a short run, so don't miss this! Highly recommended. ChiIL Mama's Chi, IL Picks List. We're also elated that this coming weekend is ACCESS WEEKEND with shows for differently abled and sensory challenged patrons. Full details are below. Kudos to Chicago Children's Theatre for taking things a step further and enhancing empathy and understanding among the school groups they're hosting, with a disability awareness education outreach program for A Light in the Dark. Access Weekend f or A Light in the Dark is Saturday and Sunday, October 22 and 23. Post show Q&As also will be offered after each performance. For guests who are deaf or hard of hearing, ASL interpretation will be offered October 22 at 11a.m. Live open captioning will be offered during every performance on October 22 and 23. For guests who are blind or with low vision, a pre-show Touch Tour of the set, props and costumes will be offered Saturday, October 22 at 9:15 a.m. Sign-up at chicagochildrenstheatre.org to take part. The 11 a.m. performance that follows will offer real-time audio description delivered via personal headset . The sensory friendly performance with quiet room is October 22 at 2 p.m.
For Access Weekend information, visit chicagochildrenstheatre.org/access or contact access administrator Alex Mauney at cmauney@chicagochildrenstheatre.org. On select weekday mornings during the run, Chicago Children's Theatre will welcome student audiences for Thodos Dance Chicago's Connections program, the company's disability awareness education outreach program for A Light in the Dark. The program includes selections from A Light in the Dark, demonstrations and interactive student participation to help young children better understand disability issues and how Helen Keller rose to become one of the 20th century's leading humanitarians. Connections presentations are at 10 a.m., Wednesday through Friday, October 12-14, and Tuesday through Friday, October 18-21. For more information, contact GroupSales@chicagochildrenstheatre.org or call (773) 227-0180 x 13. This collaboration is supported by the Chicago Community Trust, ADA 25 Chicago and NEA Art Works. A Light in the Dark runs approximately one hour and is recommended for ages 6 and up. Single tickets are $10-$39. Even better, Chicago Children's Theatre also offers customizable multi-show Membership Passes including A Light in the Dark for as much as 50 percent off single tickets. For more information, visit chicagochildrenstheatre.org or call (872) 222-9555. 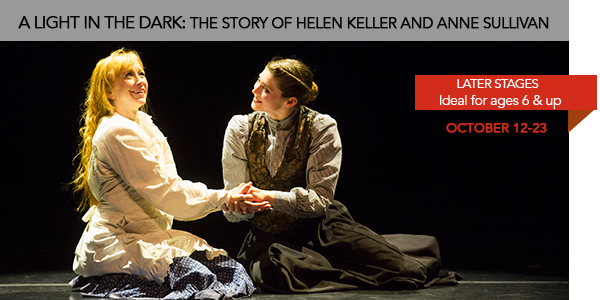 The inspiring story of Helen Keller and her teacher, as told through contemporary dance, will be shared with Chicago-area children and families this fall when Chicago Children's Theatre presents Thodos Dance Chicago's critically-acclaimed story ballet A Light in the Dark: The Story of Helen Keller and Anne Sullivan. Co-choreographed by Thodos Dance Chicago Artistic Director Melissa Thodos and Broadway icon Ann Reinking, A Light in the Dark is a family-friendly mix of movement and music that tells the true story of Helen Keller and Anne Sullivan, the caring teacher who guided the young blind and deaf girl into a life as an internationally acclaimed writer and political activist. 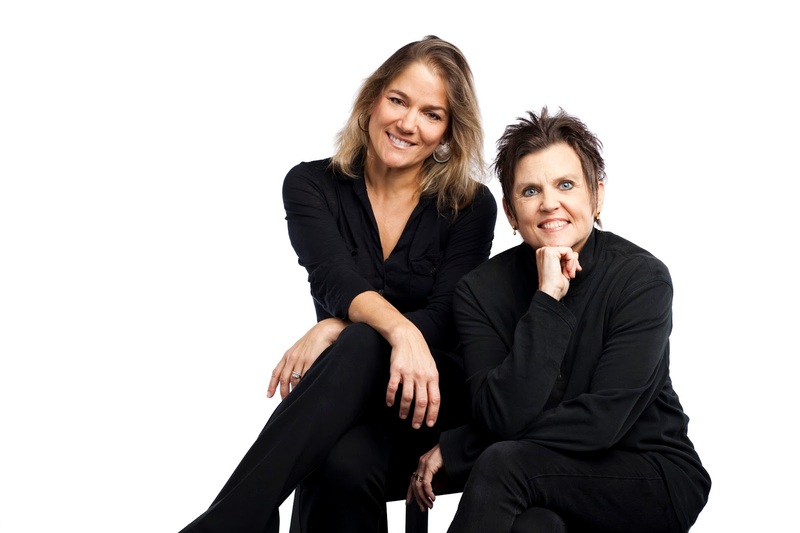 Thodos Dance Chicago's A Light in the Dark: The Story of Helen Keller and Anne Sullivan and co-choreographers Melissa Thodos and Ann Reinking. "We so look forward to this collaboration with Thodos Dance Chicago, our first ever with a dance company" said Chicago Children's Theatre Co-Founder and Artistic Director Jacqueline Russell. "Just think, hundreds of Chicago children, parents, students and teachers will experience the story of Helen Keller in a whole new way. Many will be exposed to modern dance and conversations about disabilities for the first time. And through our scholarship program, hundreds of students from underserved Chicago schools will be given free tickets." The reimagining of Keller's life through innovative dance aligns perfectly with Chicago Children's Theatre's vision of bold and groundbreaking theatrical experiences with an emphasis on inclusion and accessibility. Already, CCT offers numerous programs and services for children who are blind or have low vision, and patrons who are deaf or hard of hearing, as well as shows, classes and camps for children on the autism spectrum and with Down's syndrome. Thodos Dance Chicago premiered A Light in the Dark in 2012 at the Harris Theater for Music and Dance to much audience and critical acclaim. The Chicago Tribune called it "old fashioned storytelling art not often seen in choreography today." Dance Magazine said Thodos and Reinking's work offered "new insight into Helen Keller's world." The Chicago Sun-Times called A Light in the Dark "a powerful portrait of the meaning of communication, movement, independence, freedom and love." While A Light in the Dark subsequently toured nationally, the piece hasn't been seen in Chicago since 2013. A Light in the Dark is a full company work featuring 12 dancers, co-choreographed by Melissa Thodos and Broadway and film veteran Ann Reinking, Tony Award-winner for Best Choreography for the 1997 Broadway revival of the Bob Fosse musical Chicago, and a Tony nominee for Best Actress (Goodtime Charley, 1975), Best Featured Actress (Dancin', 1978) and Best Director (Fosse, 1999). 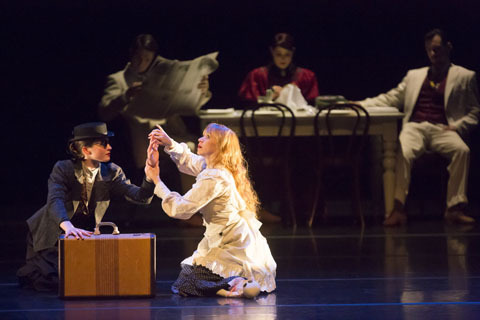 Reinking also collaborated with TDC founder Melissa Thodos on the company's first story ballet, The White City: Chicago's Columbian Exposition of 1893, named "Best Dance 2011" by the Chicago Sun-Times. Thodos Dance Chicago ensemble member Jessica Miller Tomlinson, who originated the role of Helen in 2012, returns as Helen for the CCT run, rotating performances with Melissa Panetta. Ensemble members Abby Ellison and Shelby Moran will alternate as Anne Sullivan. Original music is by Bruce Wolosoff. Dance legend Gary Chryst provided original rehearsal and stage direction. Lights are by Nathan Tomlinson. Costumes are by Nathan Rohrer. The original creative team included Christopher Kai Olsen, who produced the documentary film Shine about the making of A Light in the Dark. Now entering its 25th season, Thodos Dance Chicago is a dynamic contemporary dance company praised for its athleticism and distinctive choreographic voice, with a unique mission of inspiring expression through equal parts dance performance, dance creation and dance education. Learn more about the company and the balance of its 2016-17 season at thodosdancechicago.org. Following A Light in The Dark, Chicago Children's Theatre's 2016-17 season continues Another Snowy Day with Beatrix Potter, Will Bishop's clever sequel to his 2015 CCT world premiere based on the stories of Beatrix Potter. Meanwhile, older kids will enjoy CCT's Later Stages premiere of Theatre Unspeakable's Moon Shot, in which seven actors squeeze onto a 21-square foot table to recreate the story of America's Apollo 11 lunar landing. Moon Shot is recommended for ages 10 and up. Both shows will rotate performances November 1-20, 2016 on the Ruth Page stage. With the New Year comes a new take on an all-time favorite with the return of CCT's smash hit musical The Hundred Dresses. Adapted and created by Ralph "Ralph's World" Covert and G. Riley Mills, Sean Graney, artistic director of The Hypocrites, returns to direct this engaging and enlightening musical about a young girl who struggles to fit in with her new home and classmates, and what it takes to stand up to others-even when you're standing alone. Performances are January 17-February 19, 2017. Next, if your child has ever asked to take a gap year from school, let them find out what it's like with CCT's world premiere of The Year I Didn't Go to School: A Homemade Circus. Created and directed by Lookingglass Artistic Director Heidi Stillman and based on the popular picture book by Giselle Potter, this all-new production will be a thrilling experience for all ages, complete with circus arts. Performances are February 28-March 26, 2017. Chicago Children's Theatre will culminate its 11th season with Brown Bear, Brown Bear & Other Treasured Stories by Eric Carle, presented by Mermaid Theatre of Nova Scotia, May 2-28, 2017. All shows will be presented at Chicago Children's Theatre's performance home, the Ruth Page Center for the Arts, 1016 N. Dearborn St. in Chicago's Gold Coast neighborhood. The Ruth Page is convenient to public transportation, surrounded by family-friendly restaurants, and is just steps from Chicago's Magnificent Mile. Subscriber benefits include discounted tickets, reserved seats, flexible ticketing, discounts on CCT classes and camps, no fees and member invitations to CCT events. For memberships, subscriptions or passes, visit chicagochildrenstheatre.org or call (872) 222-9555. CCT also offers deeply discounted group rates for schools, playgroups, birthday parties and scouting groups. Email GroupSales@chicagochildrenstheatre.org or call (773) 227-0180 x 13 to learn more. 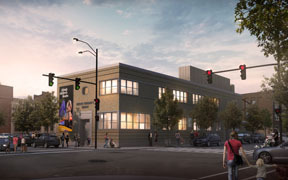 In addition to presenting its 2016-17 mainstage season at the Ruth Page, Chicago Children's Theatre is busy transforming the former, 12th District Police Station at 100 S. Racine Avenue in Chicago's West Loop into a beautiful, mixed-use performing arts and education facility designed to serve all Chicago families. Slated to open in January, 2017, Phase One of the new Chicago Children's Theatre will house five classrooms for year round courses and camps for ages 0 to 14, a space dedicated to Red Kite year round programs for students on the autism spectrum, and a flexible, 149-seat studio theater ready to host professional performances and student shows. 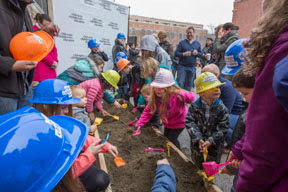 Stay tuned for more exciting news in the coming weeks about Grand Opening festivities for the company's first-ever permanent home, plus two, must-see live family productions set to premiere in the new Chicago Children's Theatre studio theater in 2017. Chicago Children's Theatre also has built a national reputation due to its strong focus on new work, producing 12 world premieres in just the last 10 years including The Selfish Giant, The Hundred Dresses, Jackie and Me, Dot and Ziggy, The Houdini Box, The Elephant and The Whale (in association with Redmoon), Mr. Chickee's Funny Money, Leo Lionni's Frederick, Wonderland, Alice's Rock & Roll Adventure, A Snowy Day with Beatrix Potter and Jabari Dreams of Freedom. These enjoyed highly successful inaugural runs in Chicago, followed by new productions at family theaters across the U.S. Meanwhile, the company has pioneered immersive theater designed for children on the autism spectrum via its Red Kite Project, and recently expanded programming for children with impaired vision or hearing and Down's syndrome. Chicago Children's Theatre also offers a full roster of after school theater classes and summer camps.